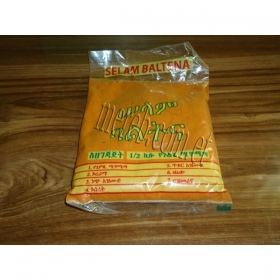 Mitmita (Amharic: ሚጥሚጣ?, IPA: [mitʼmitʼa]) is a spicy powdered seasoning used in the cuisine of Ethiopia. It is orange-red in color and contains ground African birdseye chili peppers, cardamom seed, cloves, salt, and occasionally other spices including, but not limited to, cinnamon, cumin, or ginger. It is used to season the raw beef dish kitfo and may also be sprinkled on ful (fava beans). Mitmita may also be presented as a condiment and sprinkled on other foods or spooned onto a piece of injera so food can be lightly dipped into it.